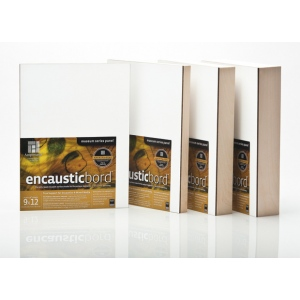 Only Encausticbord has a ready to use surface formulated for the unique demands of encaustic painting and mixed media. Encaustic gesso is applied to Ampersand's sealed Hardbord panel to form a bright, smooth and velvety surface that is ready to use with the ancient technique of encaustic painting. The ground is not only heat resistant and highly absorbent, but also holds tight to layers of wax and collage without the fear of cracking or separation. Encausticbord is available in 5 profiles: 1/8" flat, 1/4" flat, 7/8" cradle, 1.5" cradle and 2" deep cradle. This creative collaboration began in 2008 when the two manufacturers, authorities in their respective fields of wood painting panels and encaustic paint colors, started working together to dream up the perfect surface for encaustic paints. This combination of Ampersand's archival panel coating technology and R&F's expertise in encaustics led to Encausticbord, a unique wood panel that has the tooth to hold encaustic and mixed media unlike any other surface. Richard Frumess from R&F Handmade paints explains: When I began painting in encaustic in the early eighties, one of my first questions was, What can I paint on? In 1988, I began building a business manufacturing encaustic paint and in 23 years, this question remains one of the most commonly asked. The answer has been that a support should be dimensionally stable. It should be as absorbent as possible. It should be heat resistant. Plywoods and hardboards were able to fill this purpose. If you wanted a white background however, you would have to mount watercolor paper to your panel or use the labor-intensive rabbit skin glue gesso method. Happily, when we joined forces with Ampersand, we were able to craft a one-word answer: Encausticbord. Encausticbord comes with a smooth uniform white ground with the tooth and absorbency of traditional glue gesso, but it is also a multimedia board that allows you to use oil paint or aqueous paints, either alone or as under-layers for encaustic." Greek artists as far back as the 5th century B.C. practiced encaustic painting. The word "encaustic" comes from Greek and means to 'burn in', which refers to the process of fusing the paint. Perhaps the best known of all encaustic works are the Fayum funeral portraits painted in the 1st and 2nd centuries A.D. by Greek painters in Egypt. In the 20th century, the availability of portable electric heating implements and the variety of tools has made encaustic a far less formidable technique. This factor has created a resurgence of encaustic painting, and it is once again taking its place as a major artists' medium. Alfonso Ossorio, Jasper Johns, Lynda Benglis, Robert Morris, and Nancy Graves are prominent among the many artists who turned encaustic into a modernist and cross-disciplinary medium.